the most dangerous effect comes from a type of weather you can’t see. What is it? I confidently replied “ice”, to be rapidly informed that I was wrong; although black ice is invisible, you can tell it might be an issue from the fact that it’s freezing out, something you can’t possibly miss. The correct answer was wind, because although you can generally see when it’s windy, gusts can come out of nowhere that are strong enough to send the bike flying. or so the saying goes – and it’s as relevant to gardeners as to anyone else who ventures into the great outdoors. The only requirement in windy weather is to wrap up nice and warm. Whilst it is possible to be killed by falling tree branches in windy conditions, which is why some large gardens now close during high winds, the smaller trees found in most back gardens are unlikely to pose much of a threat. 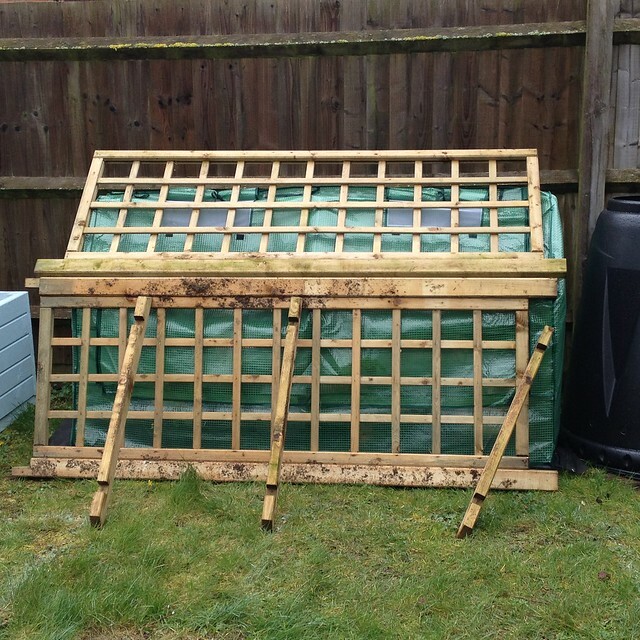 This year I used one that fitted into a raised bed, and had long ground anchors, but we still had to weigh down the plastic cover with bricks to stop it flapping around. Our neighbour’s garden is angled to the prevailing wind in such a way that their fence has had to be replaced twice in 8 years. They’ve upgraded it to one with concrete posts. As humans we can get dressed up, prune our trees and weigh down any problematic objects, and when it’s very windy we can just stay inside. But plants, of course, can’t do any of those things – they have no way to ‘batten down the hatches’. So they have evolved to cope with wind, and actually need it. They rely on air movement to bring them fresh supplies of oxygen and carbon dioxide, to whip away the moisture they transpire out of their leaves, and to alleviate the stale air conditions that cause fungal diseases. Plants need to be buffeted a bit to promote strong, healthy growth – an effect called thigmomorphogenesis (which I talked about in The Alternative Kitchen Garden: An A to Z). Thigmomorphogenesis is why it is now recommended that saplings are planted with short stakes that allow the top of the tree to flex. But as much as it is essential, wind also causes plenty of problems in the garden. 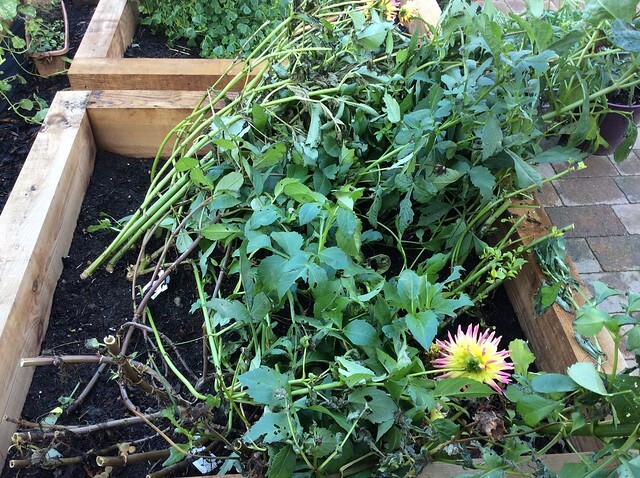 I should have staked my edible dahlias last year, they got a bit unruly, but it wasn’t until it got windy in November that they got blown down – at which point I had to take them out. In a sense this is entirely cosmetic damage, but wind rock isn’t – it’s when wind blows a plant around to the point where there is root disturbance. Wind rock is usually mentioned in conjunction with edible plants (often winter brassicas), and it can cause large reductions in yield, and even kill plants. Staking, in advance, is the cure for wind rock. The solution to protecting your plants from the wind is to plant a shelter belt. A fence won’t do it – solid barriers create turbulence that can be more damaging than the wind itself. If you have to have a fence then a more permeable one is better; the more you can see through it, the more it reduces the wind pressure on its leeward side. 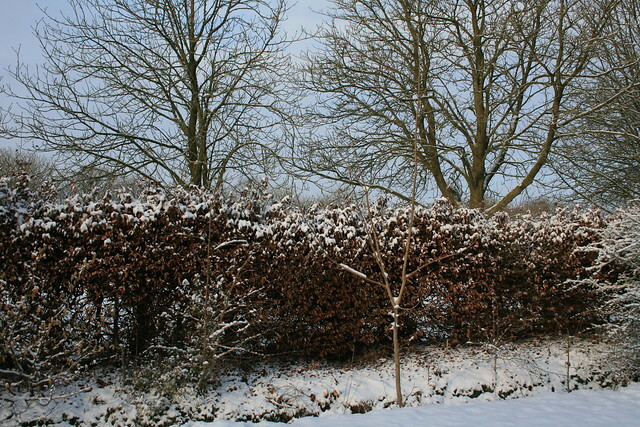 But a shelter belt (and, in most gardens, this would be a hedge) offers more benefits. It still creates shelter, increasing the range of plants you can grow, and reducing moisture loss. If you’ve got light soil it helps to prevent soil erosion, and – depending on its location – could reduce the cost to heat your greenhouse or your house, by reducing the wind chill factor. A mixed species hedge provides a habitat for wildlife, as well as providing shelter for pollinating insects that will encourage them to get to work in the garden. Crop yields are raised by 10-30 per cent depending on the crop. A windbreak hedge usually takes much less than 10 per cent of the available area, so a hedge is never wasting productive space – overall yields are increased even without taking into account any yields from the hedge itself. He also offers a detailed (but accessible) explanation of wind speeds and windbreak heights, which allow you to work out exactly what you would need to shelter your particular spot. He reminds us that there are nitrogen-fixing species that make good windbreaks, and that hedges accumulate leaf litter to feed the soil, and can provide logs and poles on top of food for humans and wildlife on top of all the other benefits we’ve mentioned. There’s definitely more to hedges than Leylandii! So if you have a windy site, or are pondering planting a hedge, it’s well worth doing a bit of proper planning and putting in something that will offer multiple benefits. Is your garden ready for winter winds? Your instructor was quite right. I used to live on the Cornish moors, and nearly got blown off the road at times. I’d be riding along quite happily, sheltered by a nice big Cornish hedge (which is an earth bank faced with stone), and then I’d reach a gate and sudden terrible blast. I’ve had the same experience in a car, of course, but it’s less forceful!